An ideal Saturday night: getting together with friends, listening to funky music, sharing lots of laughs, and dancing the night away…in a one-piece snowsuit? Before moving to Montreal, I had never heard of this festival, a slightly batty celebration of electronic music in a city that will embrace any opportunity for a party. Conceived in 2007, Igloofest is the wintry cousin of summer’s Piknik Electronik, showcasing all types of electric music from around the world. Now in it’s 6th year, it’s annual attendance has reached the tens of thousands, and shows no signs of slowing. 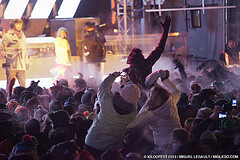 The first time that I attended Igloofest, I was not prepared for what awaited me. Revellers in all manner of dress, wearing bright hats and outlandish ski suits, dancing under the cold winter night sky to driving electronic beats spun by amazing, energetic DJs. Fire pits peppered the premises outside of the dance floor, where partygoers took breaks by warming their hands by the fire, and their bellies with rum and hot chocolate. There were interactive art exhibits, which glowed beautifully against the ice and snow sculptures that surrounded the festival site – their presence added an kind of ethereal quality to the event and fit in perfectly with this celebration of all things electronic. One of the things that struck me the most was the pure joy with which everyone danced. I had never experienced anything like it – people dancing for the sheer pleasure of dancing, braving the elements to enjoy a night of music. 2 layers of pants, snowsuits, furry hats and 3 pairs of mittens are, frankly, not conducive to stylish dancing, but no one cared, which was a refreshing change. Instead, people danced with a strange shuffling motion, keeping their feet moving while waving their hands and jumping furiously to thumping electronic beats. There is something cerebral about music outside, and the biting cold added a strangely joyous quality to the event. Igloofest is one of the reason that Montreal is such a unique city. The innovativeness behind the festival, a cheeky challenge to Montrealers to show their joie to vivre by celebrating outdoors, and the embrace with which they meet the challenge, speaks volumes of their lightheartedness of spirit, a lightheartedness that is infectious. If you get a chance, check out this fantastic festival – it’s like nothing else you’ve experienced! Nice post! Fun depiction of Igloofest. Montreal is definitely a unique city with all its festivals, year-round!